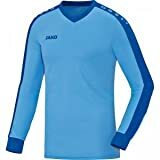 Goalkeeper jersey for kids from Jako. This entry was posted in Soccer and tagged Gardien, Gris, Jako, Maillot, Noir, STRIKER by FPSports. Bookmark the permalink.